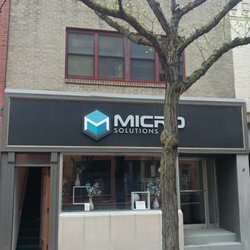 Started in 1996, Micro Solutions is a complete technology solution provider. We are 100% committed to making sure business owners have the most reliable and professional IT service. Our team of talented IT professionals can solve your IT nightmares once and for all. We offer proactive IT planning services to help reduce downtime while allowing businesses to budget for future needs. Our custom packages deliver what you need and want without overstepping the boundaries of your budget. From network security to data backup and recovery, Micro Solutions is here to team up with you and your company for expert support. Shop Local! New E-commerce site!! Take exit 46 to Corning. Drive past Corning Museum of glass. Take a right at light onto Market Street. Our office is down a few blocks on the left next to Sprague Insurance.